Wayne Homes Sandusky office treated their Raving Fans to a night out at the ‘Taste of the North Coast’ presented by The Erie County Chamber of Commerce in Sandusky, Ohio. 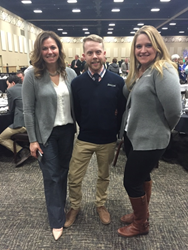 Wayne Homes employees and 16 homeowners spent the evening of January 27, 2016 at the Kalahari Convention Center in Sandusky, Ohio enjoying food, wine, and conversation at the Taste of the North Coast presented by The Erie County Chamber of Commerce. At the event, guests were able to mingle and walk around to different booths sampling several of the areas favorite restaurant’s most popular dishes. These dishes were then paired with the wines from around the world while the Great Lakes Brewing Company provided beer tastings. Since 1973, Wayne Homes has taken pride in not only customizing homes, but customizing relationships with their customers. In the early 2000’s a select group of customers referred so many of their friends and family to Wayne Homes that they became known as the “Raving Fans”. They enjoy sharing their stories and building experiences. Lisa Sidoti was recently promoted to Sales Manager at the Wayne Homes Bowling Green Model Center location.